Ugly Mugly Wins Ugliest Dog Contest : The Two-Way A Chinese crested from the UK has taken this year's ugly dog title. "I think that he is the most beautiful dog from the inside out and want the world to know that too," his owner says. 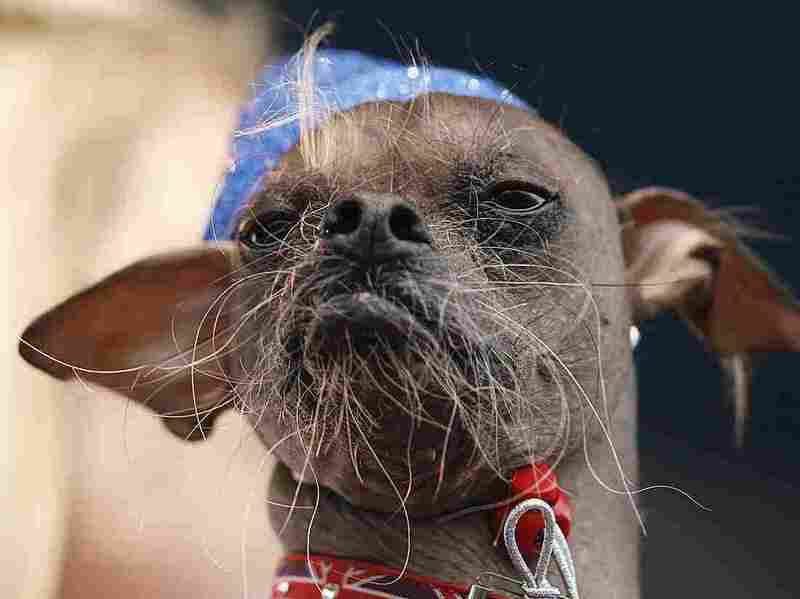 Mugly, a Chinese crested dog from the United Kingdom won the 2012 World's Ugliest Dog contest at the Sonoma-Marin Fair in Petaluma, Calif., on Friday. Living up to his name, Mugly has won the title of World's Ugliest Dog. Like many of the previous title holders, Mugly is a Chinese crested. It's a breed known for being mostly hairless and prone to a few conditions that can make the tiny dogs heavyweights in an ugly contest. Eight-year-old Mugly, however, is already a champ. Owner Bev Nicholson from Peterborough, England, claims he was named Britain's ugliest dog in 2005, as the AP says. "I think that he is the most beautiful dog from the inside out and want the world to know that too," she told her local newspaper, the Peterborough Telegraph. "He will be flying the flag for all British doggies that are challenged in the beauty department." A few oddly placed whiskers and teeth seemed to be his secret for winning the annual competition in Northern California on Friday. Looking at his 29 competitors from around the world, it must have been a tough choice. Contest host and pet psychic Sonya Fitz apparently conducted an interview round with the contestants. On the contest site she reports the dogs "loved the attention they were receiving and didn't mind the 'ugly' label one bit."